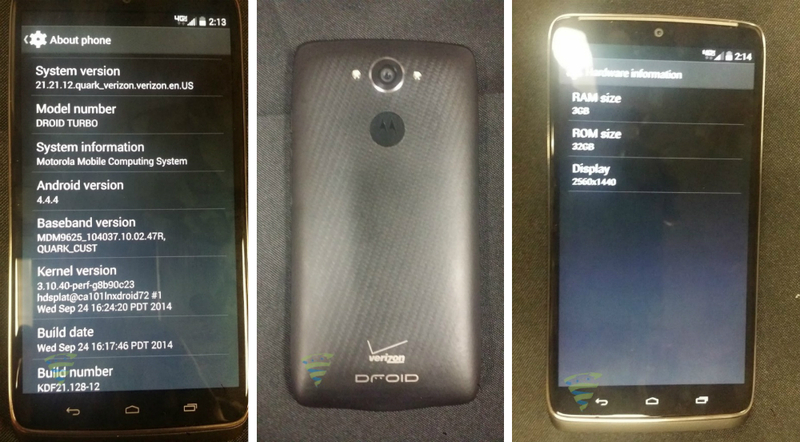 Pictures of the DROID Turbo are hitting the web, ahead of its unveiling by Motorola and Verizon next week. Thanks to many leaks, we already know everything we need to know about the Turbo, including the fact that it will sport a 5.2″ QHD display, Snapdragon 805 processor, 3GB of RAM, 21MP rear-facing camera, and a 3,900mAh battery. Up to this point, we have only seen the device through renders and poorly taken shots of its casing, but now we can finally see the device in its full state, complete with frontside and backside shots. We even get a look at its QHD display turned on. The Droid Does countdown currently sits at 5 days and 20 hours. If the Turbo is the phone you have been waiting for, you are so very close to its unveiling.